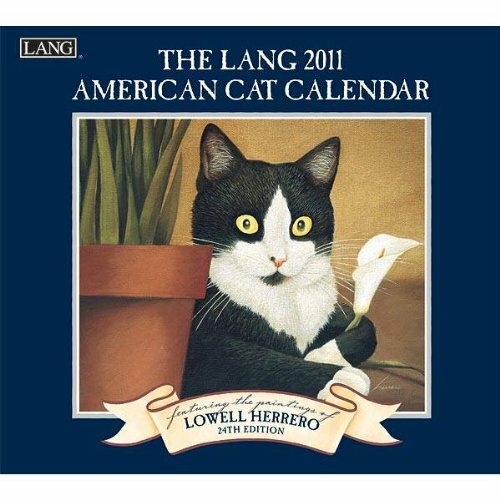 You are here: Home Cat Office Products American Cat 2011 Wall Calendar 14" X 13.5"
Printed on embossed linen paper with a brass grommet for reinforcement, this wall calendar opens to a generous size to give you plenty of room for scheduling. Perfect for your home or office, our Wall Calendars showcase the beautiful artwork of many of today's leading artists. Lang Calendars have been industry rated as the #1 calendar since 1999 and are the most popular brand among consumers year after year. Premium quality, attention to detail and exquisite artwork sets Lang Calendars apart from all imitations available! Features: 12 full color images, nationally recognized artists, linen embossed paper stock, brass grommet for hanging, moon phases. Arrives in a calendar jacket to protect the calendar during shipping. About the Artist: Lowell Herrero's passion for life is reflected in his captivating illustrations of the beloved American cat. Painting in layers of rich color and exquisite detail, Herrero portrays his feline subjects in their domestic surroundings with a sense of exaggerated realism for added fun. Herrero makes his home in California where he enjoys painting in his sun-filled art studio. Size Closed: 14" W x 13.375" H. Size Opened: 14" W x 26.75" H. ISBN-13: 9780741233998. ISBN-10: 0741233991.